Until now, there was no dedicated way to have only the events relevant to the customer set as the status of the events. Reports that had the "Last Event" field that were going out to customers, would include internal workflow events that were not relevant to the customer. 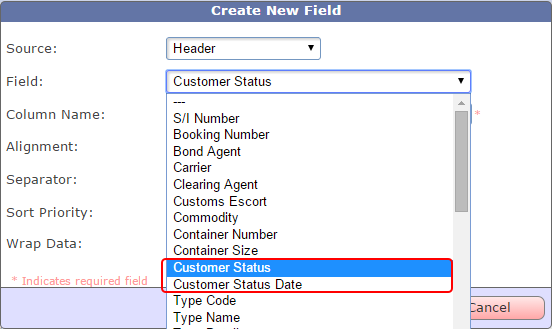 With the latest update of TrakIT, two new header fields have been introduced for Custom & Advanced Reports: Customer Status and Customer Status Date. These fields work just like the Last Event and Last Event Date fields, except that only those events that are relevant to the customer will appear here. How does TrakIT know which events are relevant to the customer? This can be set in the event definitions in the corridors. Visible - The event is relevant to customers and the event can be set as the status of the work order. Updatable - The event is visible and also updatable by the customer. Customers who are registered for Status update emails will only get emails when the Customer Status event changes, and not when other events are updated. With the latest TrakIT release, users can see what reports have them listed as a recipient. Go to Report > My Reports. Your favorite reports are now displayed under the relevant tab and the list of reports in which you are a recipient is displayed under the 'Report Recipient' tab. Please note that this list shows only those reports where you have been added as a recipient using your TrakIT profile. If your email was added directly as a report recipient, it won't display here. To remove yourself as a report recipient, just click the red cross icon. To add your self back, you will need to go to the report subscription and add yourself as a recipient.